With each new idea to stop Cicada, Team Flash seems to run into another roadblock. Their Harrison Wells, Sherloque, is preoccupied with finding Nora’s true intentions. Cisco is missing in action as he is committed to developing a cure to Meta-Humans. With their two brightest minds distracted, progress on stopping Cicada seems stalled. Barry is eager to come up with a new plan at each roadblock, and no one on the team has the foresight to veto him. With the cure nearly completed, they have a way to stop Cicada but need a way to hold him in place for at least a minute to administer it. Caitlin knows of a tool that can do just that– except it was stolen. With seemingly no other options laid out, Ralph leads and Barry and himself to an underground criminal trade to retrieve the item. He plays the part of villain very well, devoted to their mission and getting into character to remain under the radar. Meanwhile, Barry is clumsy and quickly gives away he’s not meant to be down there. To save their credibility, Barry weaves a false story to build himself up as an untraceable criminal mastermind. This is terrific news for Goldface, the top guy at this underground weapon exchange. He’ll sell the tool Barry and Ralph, as long as they assist on this job. This is not a request, its a requirement. 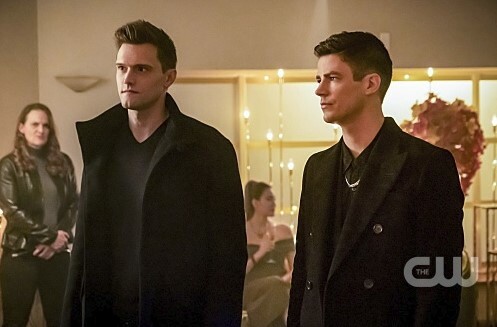 While Ralph can pretend he fits in among criminals, he has been doing a lot of good as a hero on Team Flash, and he can’t keep up the charade for long. When the two realize they’re stealing donated organs from kids, they fight back against the group. Even without their powers, they put up a decent fight and take out Goldface. Once again, they’ve failed to see a plan through to bring down Cicada. Lucky for them, Iris has been doing her due diligence of tracking down Dwyer. With a fire lit under her, Iris is determined to make her paper stand out amongst others– as she had with her blog when the threat of the Thinker loomed over them. The investigation brings her to Dwyer’s home, and soon face to face with Cicada himself. Their meeting soon erupts into a fight where Iris manages to stab and immobilize him. It’s not long enough for Barry and the team to arrive, but it opens up the door to another possible attack. Sherloque has been little help in this Cicada takedown. His obsession with Nora’s intentions has not gone unnoticed by her, nor Eobard Thawne. He suggests she finds someone to fall in love with, that’d be enough to undo his concentration. Sure enough, it does! While they hit a roadblock because Sherloque is far from charming, Nora manages to help him meet the girl of his dreams. He had already married her alternate self in five different worlds, so it isn’t a shock he takes to her. Without Iris, I’m not sure how this plot would have progressed at all. I thought Cicada, or his niece, would be more of a threat at this point in the season. But with all the stalling, it doesn’t seem as if he’s capable of more casualties or even inspired an anti-Meta-Human movement.